Once the order is closed it will be invoiced in the next bill cycle. After Snapdocs charges your company, payment takes 8-10 business days to process and distribute to the notary's bank account. You will only pay the Snapdocs fee for orders that have been successfully completed and closed. If an order is not ready to be paid out, put the order on hold. On hold orders are not billed. 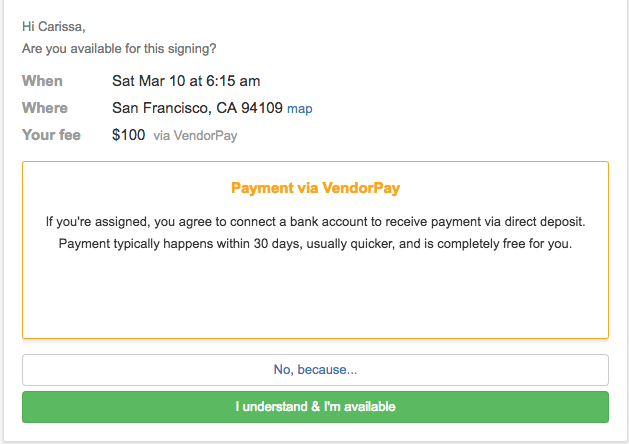 Once it's ready to be paid, remove the hold, add a signing status and close the order. If you do not need to pay the notary because the order was canceled, make sure you cancel the order in Snapdocs. Canceled orders are not billed. If the signing is not successful but a fee is owed to the notary, mark the order as Did Not Sign. You will not be charged the Snapdocs fee for orders marked as “Did Not Sign”, but the notary will be paid out. If the fee needs to be changed on the order, make sure you change the fee before the order is closed. If a notary reaches out inquiring about payment, please direct them to Snapdocs Support (support@snapdocs.com). The best part of VendorPay is that we pay the notaries for you! We will handle the communication for you as well. Once an order has been closed, it can only be reopened by reaching out to Snapdocs Support (support@snapdocs.com). Because Snapdocs is paying the notaries, we issue 1099s as well. Please note: All orders that were created before VendorPay was turned on, regardless of when they were closed, will not be paid out with Vendorpay. How will notaries know if my company is on VendorPay?